Couples getting married today are looking for ways to make their wedding unique. It’s always nice to have a personal touch that makes your day to stand out. You’ll appreciate being remembered for your creativity, and your guests will enjoy seeing something different.But different doesn’t necessarily mean spending a lot of money. You don’t have to go over the top with decorations, ice sculptures, and limousines. Doing something different can be fun and whimsical, and doesn’t have to cost a fortune. One thing that you can do for some whimsy and set the right mood for your day is to use custom wedding koozies as your Save the Date card. You can easily order custom imprinted koozies with your day date and your name on them, and send them to all of your guests. Koozies can cost about the same as custom engraved cards, but will be a memorable item that your guests will enjoy receiving. And once they have your Save the Date koozies, they can use them to keep beer and soda cold. They’ll be impressed with your creativity and be thinking about you before your day. Koozies are also a fun addition to your bridal shower, bachelorette/bachelor party, and as wedding favors for your guests. These inexpensive yet useful little items are a fun addition to any festive occasion. 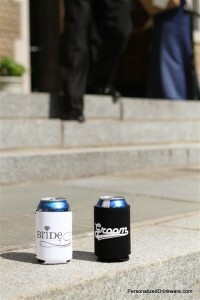 It’s easy to order custom imprinted koozies from KooziesOnline.com. They can be ready in just a few days, or even rushed in 24 hours if you’re in a hurry. Simply follow the online ordering process, including uploading your own artwork or using the free clipart gallery filled with hundreds of wedding themed images. Once you approve the proof of your artwork, your koozies will be printed. Koozies are available for cans or bottles, in a variety of colors, and with your choice of printing on one or two sides. Use custom koozies for your Save the Date cards, and they will be the talk of all of your friends and relatives for some time to come.